HMAS Albatross is the Royal Australian Navy's (RAN) Naval Air Station (NAS). Located at Nowra on the South Coast of New South Wales, Albatross was commissioned on 31 August 1948 and over 40,000 Commonwealth service men and women have served there over the years. 2018 marks the 70th Anniversary of the RAN Fleet Air Arm (FAA) and its home at Nowra. The first Australian vessel to carry the name 'Albatross' was the seaplane carrier commissioned into the RAN on 23 January 1929, at Cockatoo Dockyard in Sydney. She was paid off on 26 April 1933 and subsequently returned to the Admiralty as part payment for the new cruiser HMAS Hobart (I). She was recommissioned in the Royal Navy (RN) at the beginning of World War II and served with distinction before being sold in 1946. LEUT (later ADML Sir) VAT Smith. The WWII Royal Australian Air Force (RAAF) and RN aerodrome at Nowra, and its satellite airfield at Jervis Bay, was quickly identified as a suitable location for the RAN FAA's shore establishment. Flying had been going on at Nowra since 1930 where joy flights left from an area known as 'McDonald's Paddock'. 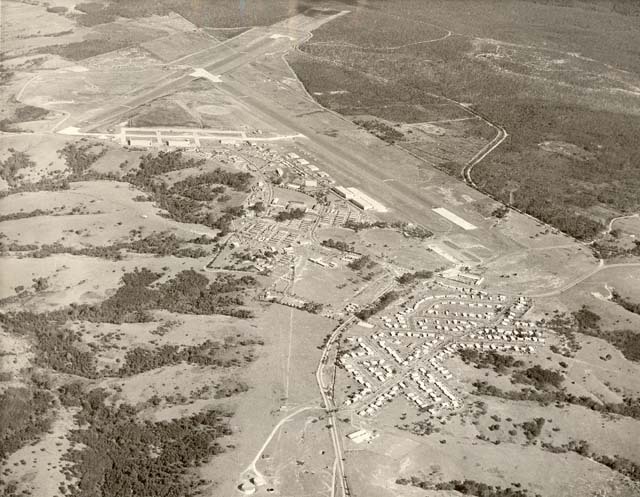 The Department of Civil Aviation (DCA) had granted a license to operate a municipal aerodrome from Nowra on 6 July 1935. An air pageant marked the opening of the aerodrome at Brown's Hole, about 6 miles (9.6km) from Nowra, in 1938 but only one commercial operator used the site on a regular basis. Subsequently, the Air Board advised the DCA that the RAAF would use the site as an Advanced Operational Base. The Government acquired 357 acres of land at the site on 14 June 1939 and a further 118 acres following the declaration of WWII. 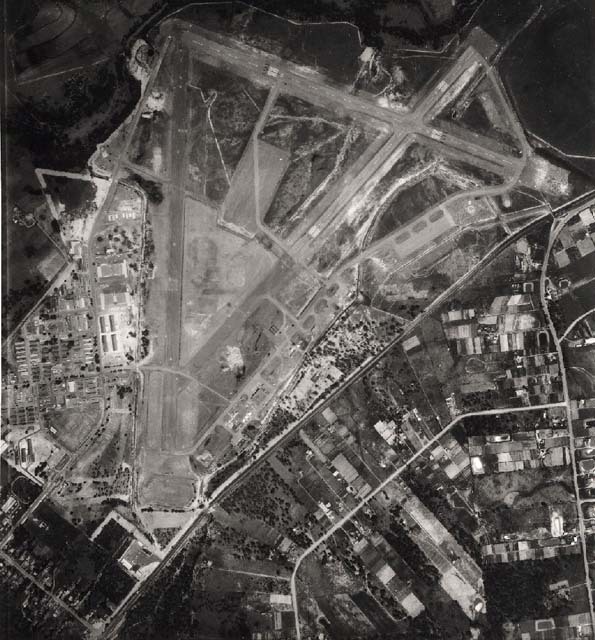 Redevelopment for RAAF purposes began in October 1939 and a further land acquisition of 50 acres followed shortly after. The base was ready for use on 21 July 1941 and became operational on 7 May the following year when a Reconnaissance Squadron and a Torpedo/Bomber Squadron arrived and commenced torpedo and bombing training. RAAF Bristol Beaufort bombers, US Army Air Corps B-26s and Netherlands East Indies Air Force B-25s all used the base during the War. With the war in Europe drawing to a close, the RN was ordered to the Pacific to support the war against Japan. The British Pacific Fleet comprised some 265 ships with Sydney acting as its main Fleet Base. In order to meet the requirements of its aircraft when its carriers were docked, the RN developed the Mobile Base concept. Seven Mobile Operating Naval Air Base units (MONABs) were established in Australia. 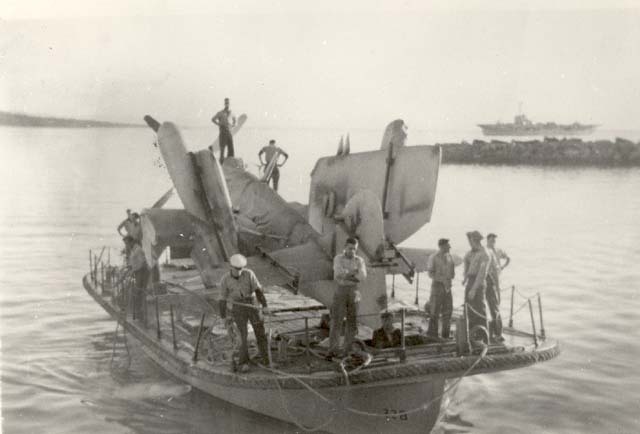 The MONABs were self-contained, mobile units formed to take over bare airfields and convert them into fully functioning naval airfields as required. MONAB 1 took over the Nowra Airfield late in 1944 and on 2 January 1945, it became Royal Naval Air Station (RNAS) Nowra, commissioned HMS Nabbington. By February, a constant stream of aircraft was moving through RNAS Nowra as RN aircraft carriers docked in Sydney for maintenance. HMS Nabbington decommissioned on 15 November 1945, shortly after the Japanese surrender, however RNAS Nowra continued to operate. MONAB 5, or HMS Nabswick, transferred from Jervis Bay to Nowra and the airfield was officially closed on 18 March 1946 and handed back to the RAAF in a caretaker capacity. The last RN aircraft departed on 5 May. Left: Disembarked Royal Navy aircraft at HMS Nabbington, circa 1945. Right: HMS Nabbington's ship's company marching through the streets of Nowra during their farewell parade in February 1946. Sea Furies and Fireflies above HMAS Sydney. The Station transferred to the RAN, also in a caretaker capacity, on 15 December 1947. Although far from complete, many of the required facilities, such as hangars and workshops, were already in place at Nowra making it a logical choice for the RAN FAAs new shore establishment. The name of the new Station was approved by King George VI in April 1948 and Naval Air Station (NAS) Nowra, HMAS Albatross was commissioned on 31 August 1948. An advance party had left Sydney for Nowra on 8 May 1948 to begin transforming the wartime airfield into a Naval Air Station. The enormity of their task soon became apparent. 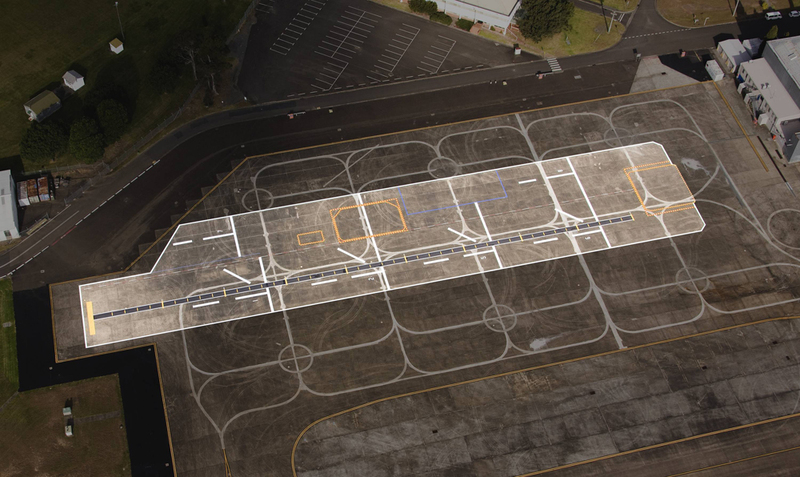 The airfield had been vacant for the past two years and had been subjected to widespread vandalism. Extensive refurbishment was required to make the Station habitable. - Pilot and Observer Training Schools. One of the RAN's new Fireflies being taken ashore by a lighter with HMAS Sydney in the background. 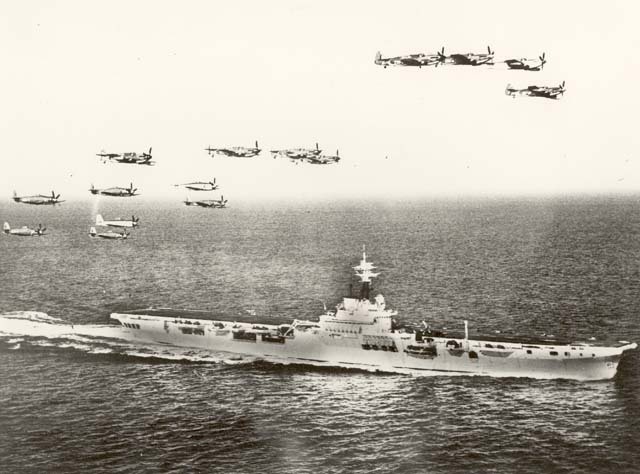 The appropriate support facilities also had to be established such as classrooms, accommodation, galleys, stores and provisions for married personnel, as well as a dummy carrier flight deck for the School of Aircraft Handling. The runways also needed much work. Although described as having a 'tarmac' surface, they were little more than compacted gravel and had a habit of breaking up, which had caused much consternation during the War. All this and only seven months to prepare for the arrival of the 20th Carrier Air Group (CAG) in May the following year. HMAS Sydney (III) arrived in Jervis Bay on 25 May 1949 with the FAAs first Naval Air Squadrons, 805 and 816 Squadrons, embarked. Two Supermarine Type 309 Sea Otters were lowered into the water and flew to Nowra while 27 Hawker Sea Fury FBIIs and 27 Fairey Firefly AS5s were landed ashore by aircraft lighters along with the associated stores, machinery, aircraft documentation and personal baggage. 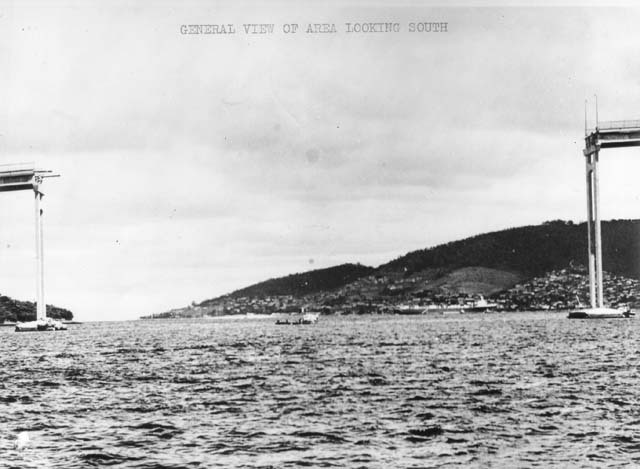 Once ashore, the aircraft were towed to Nowra in convoys, the last arriving on 29 May. It was another two weeks before flying could commence due to inclement weather. When the Sydney came out with a load of Sea Furies and Fireflies I was towing them from Jervis Bay to Nowra. The load being so heavy, I just made it up Nowra Hill, doing 2mph, the clutch slipping and a radiator that was boiling furiously. I couldn't stop otherwise I would be stuck. But I made it! Everybody cheered as I drove through the guard gates. HMAS Sydney with the ship's company on deck and Fireflies and Sea Furies embarked. The arrival of the CAG brought an extra 1000 people to the area, an increase in the local population of more than 10%. The formation of another CAG, the 21st, had already been approved and a third was being planned. The 21st CAG arrived in Jervis Bay on 6 December 1950 bringing with it another 23 Fireflies and 35 Sea Furies and all the associated personnel and equipment. Accommodation for the influx of personnel was proving to be a major problem. There was just enough basic accommodation for sailors on board but officers and families had to find accommodation where they could throughout the area, and rents soared accordingly. The 'Patch', as it became known, was established in October 1949 with 5 converted huts from the old RAAF torpedo unit complex and grew initially with tents and caravans, and later two blocks of tiny brick units and a number of prefabricated houses. The Nowra Showgrounds were also used as a temporary solution (though people were still living there as late as 1951) with tents and caravans extended with aircraft packing cases which had been used to ship Spitfires during WWII. Conditions were primitive and running water consisted of one common tap and ablutions block where hot water had to be paid for. Families did their laundry in a wood fired copper with a separate tub for rinsing. While construction moved at a steady pace, waiting lists for married quarters on board were so long during the 1950s that it was rare for a non-aviation specialist on a two year posting to qualify for one, and a two year tenancy limit was imposed on those who did get one. Many families commuted between Sydney and Nowra. Sydney continued exercises early in 1951 following the Christmas/New Year leave period with one CAG ashore at Albatross undergoing maintenance while the other was embarked. The middle part of the year, however, became extremely busy as air crews were notified on 14 May that three squadrons - 805, 808 and 817 - would embark in Sydney later that year for operations in Korea. 816 Squadron was disappointed to hear that it would remain in Australia. I remember as a young armourer being 'banished' to the bomb dump and working in the Rocket Motor Magazine with a few hundred motors stored there, together with three steel tanks containing Instant Detonators for 10lb practice bombs. The job was to get the detonators for the bombs, so the Chief and I opened one of the tanks and commenced opening tins of detonators. The tins had a soldered metal sealing strip around them which had to be removed with a pair of pliers. We had been told on our initial trade course that the detonators could not be touched by hand as the body heat could set them off. Very touchy things that had to be handled with phosphor-bronze pincers. So here I am, standing flat-footed between two tanks, one open, one shut, and the wall behind me, while the Chief is standing at the corner of the open tank, and the remainder of the mob are in the clear space. The Chief starts to 'unzip' one of the tins, everything goes well until a 'tough spot' in the solder is encountered. To resolve this problem, the Chief gives it an extra hard tug...the tin flies out of his hand heading for the roof, detonators hurtling everywhere (don't forget, I had nowhere to go! ), as if in slow motion the detonators bounced off the steel tank and the concrete floor - bodies running everywhere trying to climb the bomb proof walls - then silence. I heard myself say "Bugger me! They didn't go off!" The mob creeps back, the Chief is as white as a sheet - not a word said about the incident. 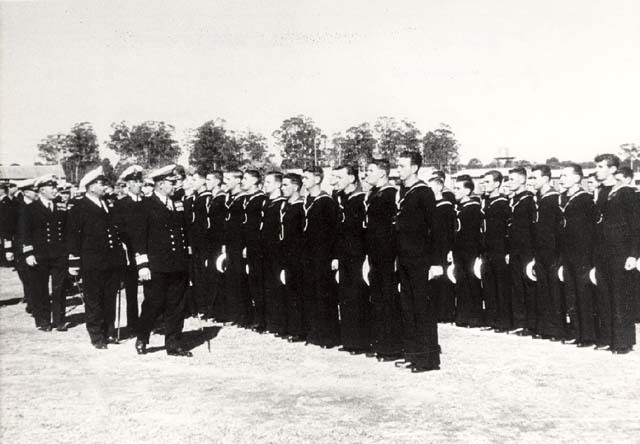 HMAS Nirimba's commissioning company being inspected by Rear Admiral Henry Showers, 1 April 1953. The second station was commissioned as HMAS Nirimba on 1 April 1953. However, with Treasury tightening the purse strings and a general Government antipathy towards a second Naval Air Station, operations at Nirimba wound down before they fully got wound up. Subsequently, Nirimba became the RAN Apprentice Training Establishment on 5 January 1956. Meanwhile, the construction work at Albatross also hit a snag when, in September 1951, the new 'H' Hangar, which was under construction, collapsed in winds in excess of 180kph. However, this setback did not prevent the Australian Joint Anti-Submarine School (AJASS) from opening in December 1951 and, in 1953, a ditching pool also opened allowing air crew to practice evacuation from a submerged aircraft. HMAS Nirimba from the air. February 1952 proved to be a tragic month for Albatross and for 816 when it lost four of its members in two separate incidents. Lieutenant Brian Wall and Sub Lieutenant Douglas Saunders were both lost on 19 February when their Firefly went missing and was believed to have crashed into the sea near Moruya, NSW. Just three days later, a Firefly carrying Sub Lieutenant Durrant Small and Observer JG Sharp crashed into sea near Seven Mile Beach, NSW. Both Small and Sharp were killed. However, the return of Sydney from operations in Korea on 3 March 1952 and the formation of 723 Squadron on 7 April did much to lift spirits in Nowra. 723 Squadron was a Fleet Requirements Unit permanently stationed at Albatross. As well as communications duties, search and rescue and refresher training for aircrew, the Squadron also provided air support for the AJASS. On 11 March 1953, the Squadron took delivery of the RAN's first rotary wing aircraft; three Bristol Sycamore HR 50 helicopters. Lieutenant Don Farquarson, RN, ran the first helicopter pilot training course in Australia at Albatross, assisted by Lieutenants Gordon McPhee and Neil MacMillan. Albatross was gradually becoming a more comfortable and hospitable place in which to live. Although an early suggestion to include members of the Women's Royal Australian Navy (WRAN) into the ship's complement was quickly dismissed, the construction of a cinema and the spontaneous formation of the volunteer Naval Blue Jacket Band in the early 1950s provided some much needed entertainment for the crew. The band developed an excellent reputation and played at many ceremonial events including the opening of Parliament in Canberra and the visit of Queen Elizabeth II and Prince Philip to Albatross. On 18 June 1954, 723 Squadron took delivery of the RAN's first jet aircraft. Lieutenant Peter Goldrick accepted the de Havilland Sea Vampire Mk T22 at the de Havilland workshops in Bankstown before flying the aircraft to its permanent home at Albatross. The Sea Vampire was used as a land based trainer for air crews converting to the soon to be delivered Sea Venom. A restored Firefly now with the RAN Historical flight bearing UN markings as they did during the Korean War. With more families moving into the married quarters at Albatross, attention soon turned to the education requirements of the resident children. Approval was given in 1954 to establish a primary school on the old Nowra Hill School site with extra land secured to enlarge the school's recreation area. The Nowra Hill Public School opened on 22 October 1955. Integration with the local population had been a problem ever since the first sailors arrived at Nowra in 1948. A lack of amenities in town for the sailors meant that relations were often strained and on 19 April 1949, a public meeting was held to determine how best to resolve the problem. A committee was established at the meeting involving both service personnel from Albatross and members of the local community with the aim of raising funds to establish a venue in town for sailors to relax when off duty. Their efforts came to fruition when, on 21 October 1954, the White Ensign Club was officially opened by Vice Admiral Sir John Collins, KBE, CB, RAN (Rtd) in a renovated building which had once been the Nowra Maternity Hospital. It included sleeping accommodation, a kitchen and canteen, billiard room, reading room and a chapel. Bar facilities were provided in accordance with RAN regulations. The Club was a favourite amongst Albatross personnel for many years. Community service tasks quickly became a feature of operations at Albatross, particularly for 723 Squadron's Sycamores. The Squadron rescued over 100 people in February 1955 in flood relief operations in Dubbo, Maitland and Narrabri as well as other Search and Rescue, and Police assistance operations throughout the 1950s. Left: A Sycamore on the tarmac at HMAS Albatross. Right: A Sea Vampire on the tarmac at HMAS Albatross. 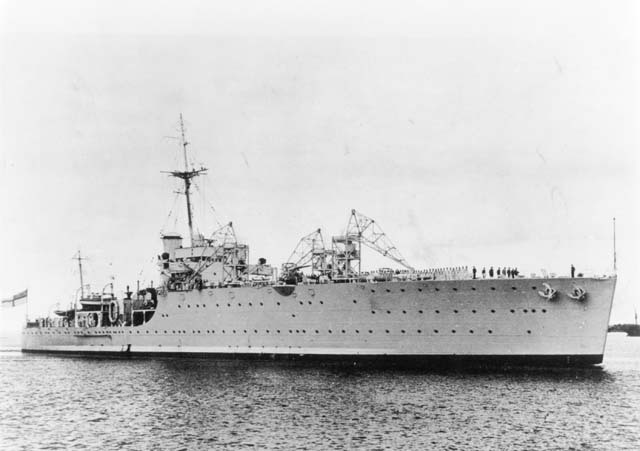 Lord Mountbatten yesterday described the Naval Air Station HMAS Albatross at Nowra as the smartest station he had ever seen. 'Of any type, in any service, in any country.' he added. 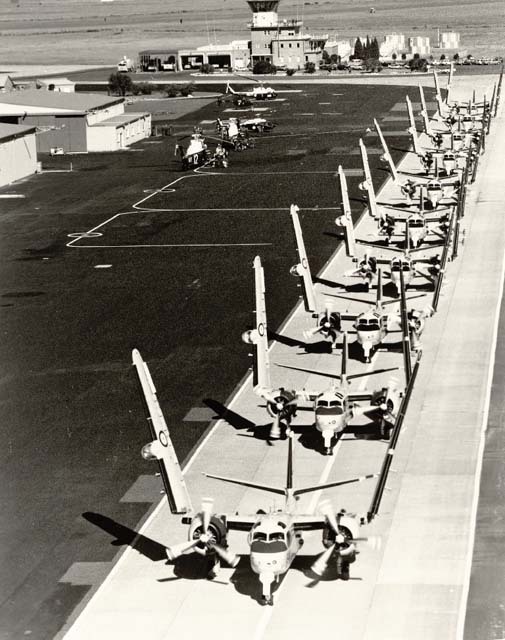 Aircraft on the tarmac at HMAS Albatross. In the foreground are Gannets followed by Sea Venoms, Sea Vampires, a Dakota and Wessex helicopters. 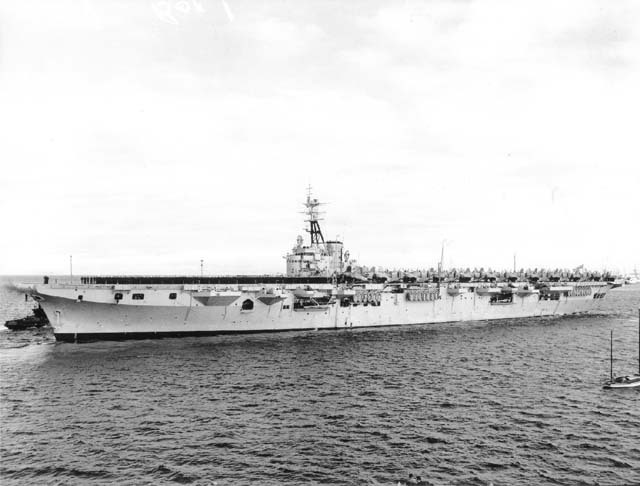 HMAS Melbourne (II) arrived in Australia for the first time at the end April 1956 and disembarked her cocooned aircraft at Jervis Bay the following month. Recalling similar activities seven years earlier, the new de Havilland Sea Venom FAW. Mk 53s and Fairey Gannet AS1s, and the associated personnel and stores, were towed to Albatross by road. A period of intense activity followed as aircrews at Albatross worked up and familiarised themselves with the new aircraft. Captain VAT Smith assumed command of Albatross on 14 January 1957. Three squadrons were permanently stationed at NAS Nowra while the other three were normally embarked in Melbourne. The FAA was conducting its own Operational Flying Schools for aircrew graduating out of the RAAF system and a decompression chamber was made available for use by the Jet Conversion Unit. Training schools had been established for helicopter pilots, observers, aircraft handlers and safety equipment sailors, and a number of engineering courses were run from Albatross. The AJASS was still resident, with flying support coming from 723 Squadron, and a number of recreational clubs had been established with more emerging all the time. In spite of all this, morale was low at Albatross. Captain Smith immediately set about rectifying the situation. Divisions became more regular, strict adherence to the timetable was encouraged and gardening became a mandatory activity on Friday afternoons. Not only did this allow those travelling out of Nowra for the weekend to get away early and avoid traffic, it also broke up the monotony of the usual workday routine and promoted pride in the Station. A number of construction projects also received funding as part of a Navy-wide construction program totalling £2.25 million. More married quarters were built and some of the WWII huts serving as sailors' accommodation were replaced. A new air traffic control building and battery charging workshop were approved as was the development of the Beecroft Bombing Range and surface ships' bombardment range, which also involved the construction of an operational observation post. Captain Smith took on a rather unusual role when the NSW Government dismissed the Council of the Shoalhaven Shire and appointed an administrator in 1957. In the absence of a Shire President, Smith was called upon to perform a number of civic duties. 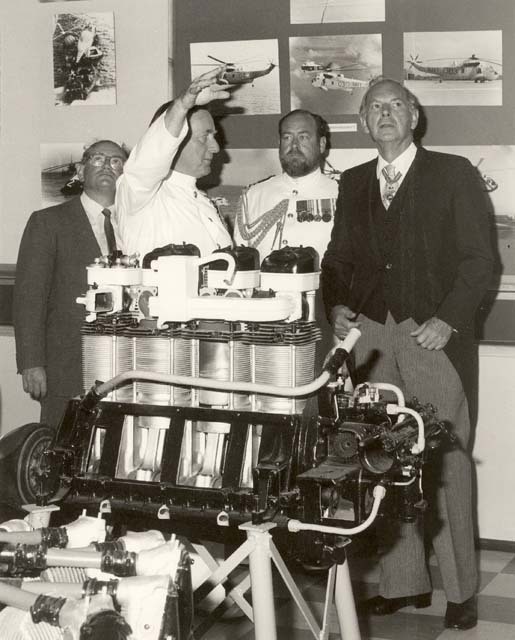 This situation helped to improve relations between Albatross and the local community, and the community expressed its appreciation of Smith's efforts with a civic farewell when he and his wife, Nanette, departed in November 1959. 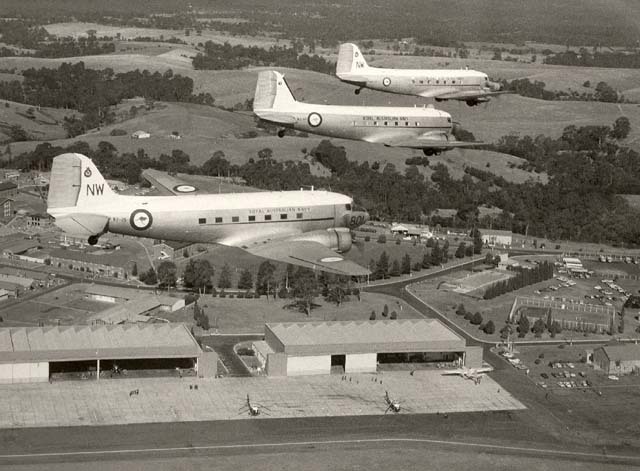 Dakotas in formation over NAS Nowra. As the 1950s drew to its close, it became apparent that Government support for an increasingly expensive fixed wing naval aviation wing was waning. Albatross personnel and their families displayed remarkable dedication in the early 1960s in the knowledge that fixed wing naval aviation was likely to be discontinued in the near future. The FAA continued to meet its responsibilities and maintain its extraordinarily high, exacting standards. 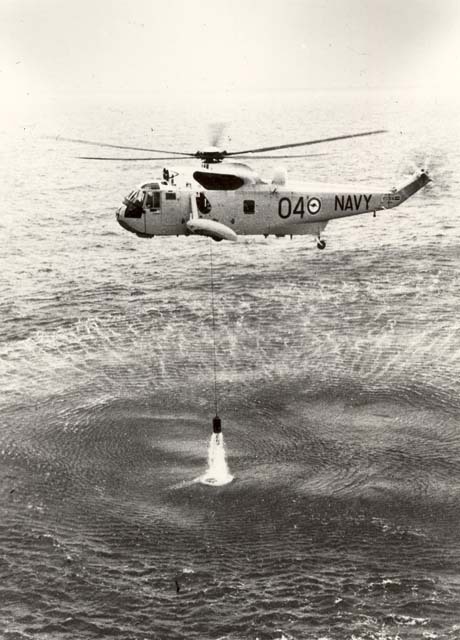 The Government had indicated in 1960 that an Anti-Submarine Warfare (ASW) helicopter component of the service would be maintained but this did little to raise the morale of those who had spent most of their working lives in fixed wing naval aviation. By the end of 1963, 724 (stationed at Albatross) and 816 Squadrons were the only FAA Squadrons operating fixed wing aircraft until fixed wing operations recommenced in earnest in 1968. Fixed wing flying training was meant to cease in 1961, however, fixed wing training continued at Albatross under the auspices of 724 Squadron. January 1964 heralded the arrival of the first WRANs at Albatross. Some 70 WRANs were posted taking up positions such as radar plotters in the AJASS, administration, radio operators, transport drivers, sick berth attendants, cooks and stewards. The number soon increased to 90 and the new arrivals settled in very quickly. I approached the ship from the port quarter in a descending turn. I noted that Voyager was not in the correct RESDES [Rescue Destroyer] position. At 20:56 a huge ball of flame lit the sky. It was the boiler room of Voyager exploding. As a result of the collision, Melbourne (II) had lost a number of aerials which had been lowered to the horizontal position for flying, so the ship asked me to activate the rescue services at Nowra. I advised Nowra that there was an emergency and to send all available helicopters to the scene and to also sail the search and rescue craft from Jervis Bay...It was an outstanding effort by the helicopter squadrons and in a very short time helicopters were over the accident area. In fact at one stage there were probably too many aircraft in the one small area...At first light the fixed wing squadrons had aircraft there and we continued to fly all through the day in the hope of finding survivors. 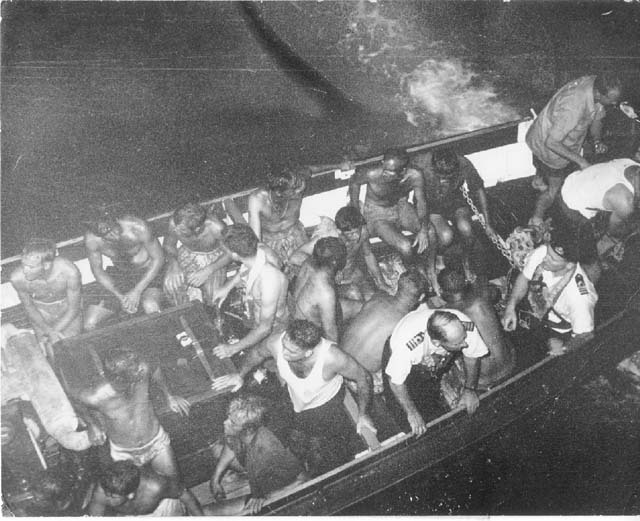 Survivors in the aftermath of the Voyager disaster. Aircraft from Albatross participated in search and rescue efforts in the aftermath of the collision. 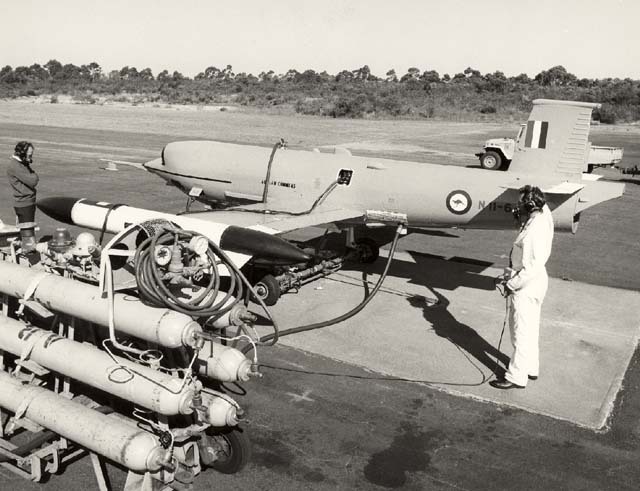 The air strip at Jervis Bay underwent its own expansion program in mid-1965 when it became home to the RAN's new GAF Jindivik pilotless target drone. Designed and built in Australia, the remote controlled GAF Jindivik, affectionately known as 'Jindy,' had an excellent speed and altitude performance profile, and could trail smoke, heat or other sources from winches to test the discrimination of weapons systems detectors during live firings. A new hangar was constructed to house the aircraft and the associated equipment, and accommodation blocks were renovated to house the influx of staff. The facility opened in January 1967. The courage of naval airmen was displayed on the morning 21 May 1966 when Albatross scrambled two Iroquois from 723 Squadron to search for survivors from the Dredge WD Atlas which had capsized about 18 kilometres south east of Jervis Bay. The pilots, Lieutenants Pat Vickers and Barrie Lovett, and their crews, Petty Officers Peters and McCreanon, hovered their helicopters in 45 knot winds just a few feet over ten metre waves. Thirteen sailors lost their lives but thanks to the efforts of the airmen, four others were rescued. When an officer proposed that 723 Squadron deserved an Albert Medal for saving life at sea, the suggestion was laughed out of the Albatross mess. The Navy News reported on 10 June 1966 "The pilots...do not think they are heroes, daredevils or stuntmen. Just men doing their job." PO McCreanon was honoured with a Queen's Commendation for his bravery in the rescue. A reappraisal of the Naval Three Year Plan in 1965, due partly to a deterioration in the political climate in Australia's area of interest and partly to a lot of hard work at Navy Office, put fixed wing naval aviation back on the agenda. The Department of Defence recognised that without fighter protection, the RAN would be unable to meet its commitments to Australian forces overseas. It was decided that the RAN would purchase ten new McDonnell Douglas A-4G Skyhawks, including two TA-4G model trainers, and 14 Grumman S-2E Trackers to embark in Melbourne following her refit in 1968. Pilots and ground crew started training at Albatross as early as mid-1966 and the new aircraft were transported to Australia by Melbourne in November 1967. Just as had happened twice before, the Skyhawks were disembarked at Jervis Bay and transported by road to Albatross. The Trackers, however, remained aboard Melbourne until she reached Sydney where they were transported by road to Mascot Airport, checked, flight tested and flown to Albatross later in the year. A GAF Jindivik pilotless drone being refuelled. In addition, a Tracker simulator was also ordered at a cost of $2.5m with an ongoing maintenance contract of $80,000 pa. The Weapons System Trainer (WST) was to be built into two trailers, allowing it to be towed, with the cockpits and instrument console in one trailer, and the computer, associated electronics and workshop in the other trailer. The WST was meant to be operating by the end of 1967 but a fire, started by an urn that had been left on overnight, caused enough damage that it was returned to the US before it was commissioned. It would later be installed in a purpose built brick building at Albatross and became operational in May 1970. Lieutenant Commanders John Da Costa (805 Squadron Commanding Officer) and Graeme King (805 Squadron Senior Pilot) travelled to the US to learn how to fly and instruct on the Skyhawk and, along with Lieutenant Mike Gump, USN, conducted the first conversions and Operational Flying School (OFS). The first six pilots began training at Albatross in January 1968 but stores problems quickly brought training to a standstill. Maintenance crews were having problems getting spare parts for engines, airframes and weapons systems and even had to resort to using cumbersome folding step ladders in place of boarding ladders to get people into and out of the aircraft. The Government had planned to send graduating OFS Skyhawk pilots to Vietnam to serve in US Marine Corps (USMC) squadrons. However, the stores problems meant that the first OFS course finished six months late and by this time, the US policy in Vietnam had become one of 'de-escalation'. That, however, did not preclude RAN involvement in Vietnam. The RAN already had a significant presence in the region with HMAS Sydney (III), converted to a fast troop ship, deploying troops as early as May 1965, and a Clearance Diving Team and a destroyer operating in Vietnam from February and March 1967 respectively. On 14 July 1967, the Minister for Defence, Mr Allen Fairhall, responded to a US request to Australia for helicopters and crews to provide combat support to the war effort by announcing that the RAN would provide 8 pilots, 4 observers, 24 maintenance personnel, 4 air crewmen and 6 support staff. The detachment, known as the Royal Australian Navy Helicopter Flight Vietnam (RANHFV), served as part of the US Army's 135th Assault Helicopter Company (AHC) flying Bell UH/1B and UH/1H Iroquois helicopters. Pilots were drawn from existing FAA Squadrons and were officially allocated to 723 Squadron, undertaking eight weeks of training with the Squadron at Albatross. The first flight formed and operational training began on 28 August 1967. Their training included troop lift, insertion and support as well as survival training, code of conduct training, small arms and colloquial language. 723 Squadron suspended all other activities to devote all possible resources to training the RANHFV. No. 5 Squadron RAAF also assisted by providing M60 door guns and mounts as well other advice and assistance, and the flight completed training by conducting field exercises with the Australian Army. Four contingents of the RANHFV served in Vietnam between 1967 and 1971, with a further RAN detachment serving with 9 Squadron RAAF in 1968/69, though the dangers of flying were not limited to those overseas. On 5 June 1968, three members of 723 Squadron, Lieutenant Peter Ward, Petty Officer DJ Sanderson and NAMAE RK Smith, were lost when their Iroquois crashed over the cliff at Beecroft Head Firing Range and into the sea while on a range clearing flight. The aircraft had just landed a fourth crew member, Lieutenant Robert Ray, who reported the crash to Albatross. Improvements and upgrades continued at Albatross with a new avionics workshop constructed and new surveillance radar installed. A new Tactical Air Control Air Navigation (an ultra high frequency electronic air navigation system) installation was operational by the end of the decade. New 'Bliss' arrestor gear was also installed, replacing the primitive system of arrestor wires stretched across the runway attached to anchor cables. The new system could operate in either direction on the runway (the old system could only operate in one direction) and was capable of arresting an aircraft with engine failure on take off, brake failure on landing, and could handle all aircraft in service with the FAA. Albatross celebrated its 21st Anniversary with an Air Day on 12 October 1969. A static display covered some 15,000 square metres of hangar space and a tarmac display featuring Sea Furies, Fireflies and Gannets. The aerial display included Skyhawks, Trackers, Iroquois and Westland Wessex Mk 31B helicopters as well as a display by the RAN Gliding Club. The Air Day was a huge success with the Skyhawks stealing the show. Left: A Skyhawk TA-4G Trainer at HMAS Albatross. Centre: RANHFV training for an 'insertion'. Right: Wessex at HMAS Albatross taxiing for the 21st Anniversary flypast. At the end of the 1960s, four squadrons were permanently stationed at Albatross. 723 Squadron was a Fleet Requirements Unit (FRU) but most of its time was spent training air crews for Vietnam, 724 Squadron was conducting Skyhawk Operational Flying School (OFS) and still flew Sea Venoms and Vampires for FRU, 725 Squadron was responsible for Wessex Initial Flight Training and OFS, and 851 Squadron was performing twin engine pilot conversions, Tracker OFS, and FRU and Communications duties. HMAS Albatross in the early 1970s. VC851 Squadron (FAA squadrons had adopted United States Navy prefixes) made history in 1973 when it took delivery of two Hawker Siddeley HS748s. The first arrived at Albatross on 7 June, flown from the Hawker Siddeley factory in Woodford near Manchester marking the first transglobal flight by RAN personnel. The second aircraft arrived on 17 August 1973. The twin turboprop HS748s were used for navigation training, communications and transport duties, and also took part in continuation trials for the Ikara missile system. The FAA became embroiled in industrial unrest in July 1974 when the Storeman and Packers Union black-banned the RAN resulting in fuel shortages and flying restrictions. This became a serious, and even life threatening, issue the following month when heavy rain and flooding inundated the Nowra area. The FAA was called upon for disaster relief operations but the fuel shortage gave rise to concerns about whether rescue efforts would have to cease. Eventually common sense prevailed and fuel tankers began to arrive allowing personnel from Albatross to rescue some 352 people. 1974 also saw a number of people, mostly volunteers, devote much time and effort towards establishing a Naval Aviation Museum. Admiral Sir Victor Smith KBE CB DFC, by then Chief of the Defence Force Staff, opened the Museum in 'D' Hangar at Albatross. 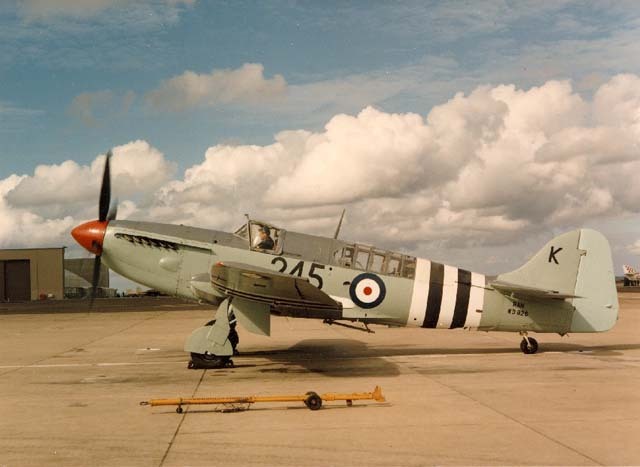 Various aircraft that had been saved by previous Commanding Officers, along with many recovered from the dump, were cleaned, repaired, repainted and assembled together undercover. The Museum has undergone many changes over the years but remains a popular attraction at Albatross to this day and also features dioramas, photographs, models and other assorted paraphernalia and ephemera. 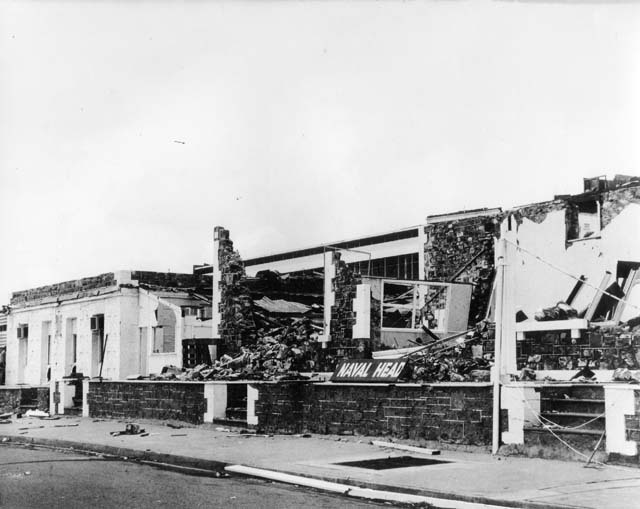 Naval Headquarters in Darwin in the aftermath of Cyclone Tracy. 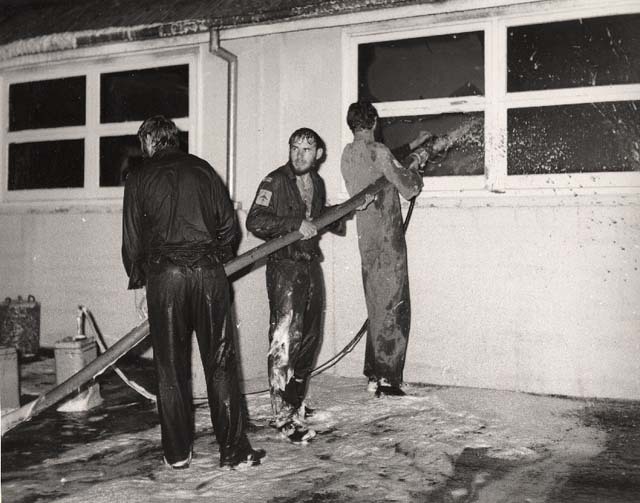 Albatross personnel were called into action to assist in relief efforts for one of the most devastating natural disasters in Australian history in 1974. When Cyclone Tracy hit Darwin on Christmas Eve, Albatross personnel were called back to NAS Nowra, leaving their homes and loved ones at Christmas time, to begin support flights to the northern capital. Many travelled from as far a field as South Australia and Queensland with many more making contact from Central and Western Australia to see if they were needed. After picking up personnel and supplies in Sydney, the HS748s of VC851 Squadron were on the ground in Darwin by Boxing Day. 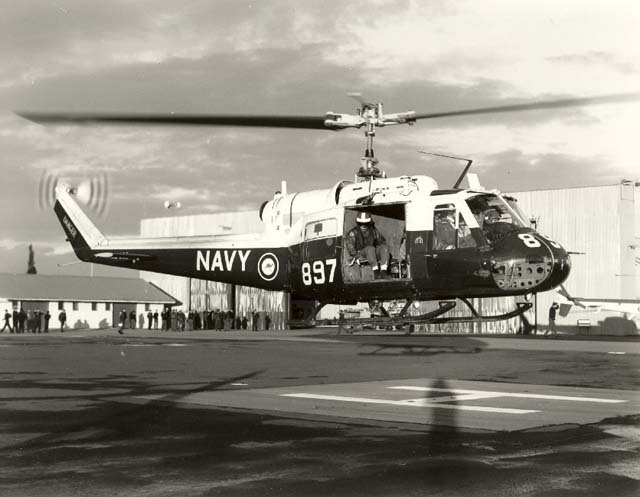 Meanwhile, the Wessex helicopters of HS817 Squadron were en route embarked in HMA Ships Melbourne (III) and Stalwart (II). The HS748s approach to the Darwin airfield was made over a relatively unpopulated area so the full devastation of the Cyclone was not immediately apparent to the crew. However, the Commanding Officer of VC851 Squadron, Commander Jim Campbell, later said that the force of Tracy was evident when he saw "a large white refrigerator firmly wedged in the branches of a tree about 40 to 50 feet (12-15 metres) above the ground." There was no hangar for the crew to work in once they landed, just an open concrete area. Maintenance support consisted of the maintenance personnel who accompanied the flight, and the tools and spares they brought with them. The maintainers would double as flight stewards for those being evacuated on the return flight, mainly naval dependants from HMAS Coonawarra, and converted the rear sections of the planes into an area for children to play and sleep. Maintenance personnel at Albatross were then faced with a 12 hour overnight period to service, prepare and load the aircraft with freight for an 8:00am departure the next morning. The families of Albatross personnel also collected pharmaceuticals for distribution in Darwin as well as toys and magazines. Tasman Bridge on the Derwent River after the collapse. Melbourne, meanwhile, arrived in Darwin on 2 January 1975 and HS817 Squadron's helicopters made an immediate impact on Operation NAVY HELP DARWIN. The Squadron was able to conduct search and rescue sorties in areas that had previously been inaccessible enabling evacuations to be carried out quickly and over great distances. The relief effort for Darwin was interrupted in the early hours of 6 January 1975 when VC851 Squadron was again called upon to provide assistance, this time in Tasmania. At 9:27pm the previous evening, the bulk carrier Lake Illawarra collided with the Tasman Bridge on the Derwent River collapsing two piers and 127 metres of bridge decking. Five commuters and seven crewmembers from the Lake Illawarra lost their lives. At 1:15am on the morning of 6 January 1975, VC851 Squadron received word that they were required to fly a Navy Clearance Diving Team to the scene. An HS748 was prepared and departed Albatross for Sydney at 2:30am. It arrived in Hobart five hours later. I have been informed by the Commanding Officer, HMAS Albatross of the exceptional devotion to duty of the Commanding Officer, Officers and sailors of VC851 HS748 Flight during the period 25 December, 1974 to 10 January, 1975. The zeal and enthusiasm displayed throughout the preparation for, and conduct of the 14 sorties as part of Operation NAVY HELP DARWIN in the aftermath of Cyclone Tracy, and which enabled a sortie to transport a rescue team to Hobart as a result of the Tasman Bridge disaster during this operation, is most commendable. The conduct of the flight, the motivation displayed despite personal discomfort caused by long hours reflects great credit on all officers and sailors concerned. I would be grateful if you would inform all those involved of my admiration of their conduct. 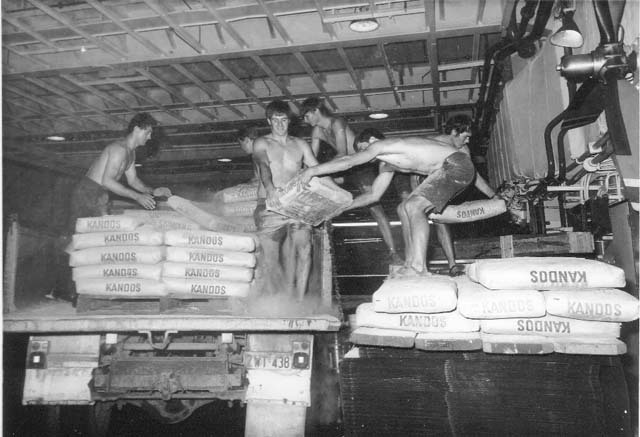 RAN sailors unloading bags of cement in Darwin. Darwin's mayor, Harry 'Tiger' Brennan, echoed the Rear Admiral's commendation saying "We owe the Navy the greatest debt of all." Both Tracker squadrons, VC851 and VS816, suffered major setbacks on 4 December 1976 when most of their aircraft were destroyed in a hangar fire at Albatross. At around midnight that evening, 'H' hangar, the same one that had blown down in high winds 25 years earlier, was engulfed in flames and all but three of the RAN's Tracker fleet were lost. One of these was at the Hawker de Havilland workshops in Bankstown at the time, undergoing inspection. Sailors fighting the hangar fire at HMAS ALBATROSS on the night of 4 December 1976. 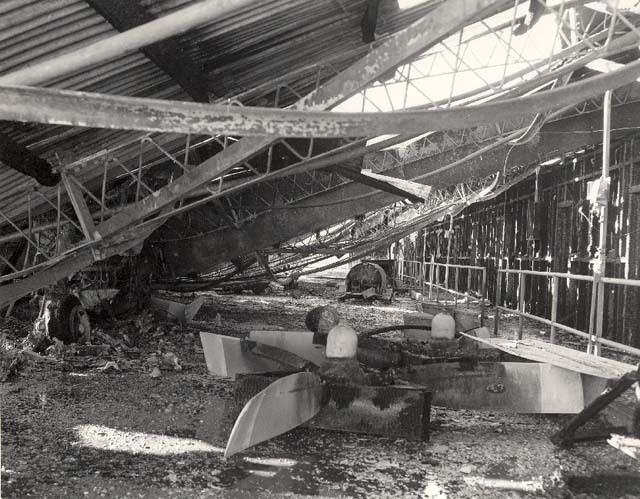 The remains of Tracker aircraft in what was left of 'H' Hangar after the fire. Sixteen officers and sailors were later commended for their actions. Police suspected arson and a Board of Inquiry was immediately announced. On 19 January 1977, a 19 year old junior sailor from one of the Tracker squadrons admitted to starting the fire. He was subsequently found to be mentally unstable at his court-martial. The fire had also forced the temporary closure and subsequent relocation of the Australian Naval Aviation Museum. The 1970s had been an eventful decade for the FAA, and while all this was going on, the Station continued to be upgraded. New works included a mechanical workshop, air surveillance radar, a fuel storage area and an upgraded Air Traffic Control system. Accommodation also continued to be upgraded including a new Wardroom and Senior Sailor's Mess. The decade came to a close with HMA Ships Albatross and Creswell granted the first Freedom of Entry to the newly established City of Shoalhaven (replacing the previous Shoalhaven Shire Council) on 24 November 1979. Left: LCDR Terry Ford leads Officers Divisions at the Freedom of Entry parade on Junction Street, Nowra 1979. Right: HMAS Albatross' Commanding Officer, CDRE George Jude, gets 'rowed' ashore in a Sea Fury upon his retirement in 1980. HMAS Albatross Commanding Officer CDRE Tom 'Toz' Dadswell guides His Excellency the Governor-General Sir Ninian Stephen through the Fleet Air Arm Museum along with CMDR David Campbell, military secretary to the GG, and the Federal member for Macarthur, the Hon. Michael Baume in 1983. Around 1600 personnel were stationed at Albatross at the beginning of the 1980s. New construction work continued as Albatross entered the new decade with work commencing on a multi-million dollar 'fuel farm' to replace the old storage facility. The realisation that Station security needed to be addressed in the aftermath of the 1976 hangar fire saw Naval Police and Guard Dogs take up that role. New kennels were built in the early 1980s to accommodate Albatross' new canine residents. In 1982, the FAA provided aircrew, Air Traffic Controllers and sailors for a United Nations peacekeeping force in the Sinai overseeing the implementation of a peace treaty between Egypt and Israel. Although ostensibly a RAAF operation, naval personnel supplemented the commitment until 1986. In spite of its commendable service, the future of fixed wing naval aviation remained in doubt. The chances of acquiring a new carrier to replace Melbourne (III) when she paid off in the mid-1980s became increasingly thin and Naval Aviation's focus became firmly fixed on rotary wing and Vertical/Short Take-Off and Landing (VSTOL) aircraft. It seemed almost certain that the Trackers and Skyhawks of the RAN would cease operations after Melbourne's demise. However, the surveillance capabilities of the Trackers, highlighted during the Trochus operations in northern Australia and anti-terrorism patrols in Bass Strait, suggested that they may yet have a future in shore based ASW or surveillance tasks. With Melbourne's decommissioning in June 1982 it was not long before the RAN's two front-line fixed wing squadrons, VF805 and VS816, were disbanded at Albatross on 2 July 1982. 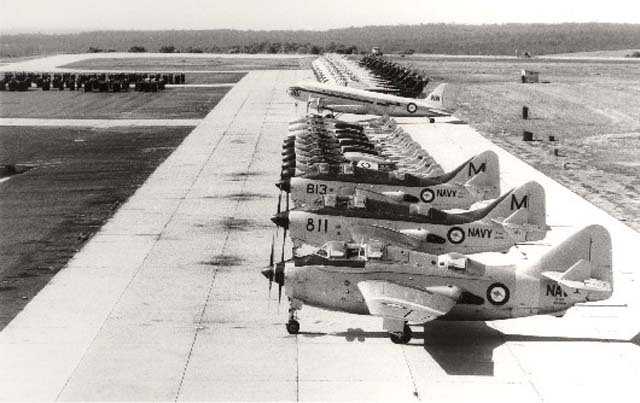 The last ever flypast of RAN fixed wing aircraft occurred on 8 December 1983 at a graduation ceremony at HMAS Creswell. VC851 Squadron, the last of the RAN's fixed wing squadrons, decommissioned at Albatross on 31 August 1984. The Squadron's HS748s were transferred to HC723 Squadron where they performed electronic warfare training support and VIP transport duties from Albatross until they were decommissioned on 30 June 2000. Just as they had done 20 years earlier when fixed wing naval aviation was discontinued, the men and women of the FAA displayed commendable dedication during this uncertain period. 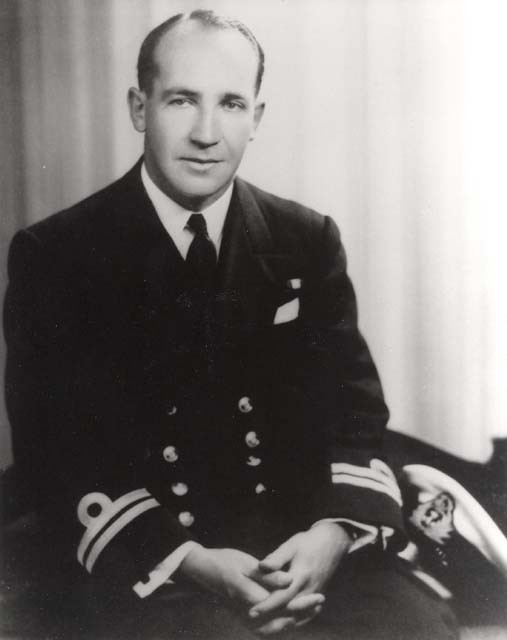 Albatross' Commanding Officer at the time, Commodore Tom 'Toz' Dadswell AM, said in his farewell speech in April 1984, "Never has a Commanding Officer been given so much loyal support and had so little to give in return". Although fixed wing operations had ceased in 1984, embarked operations did not. 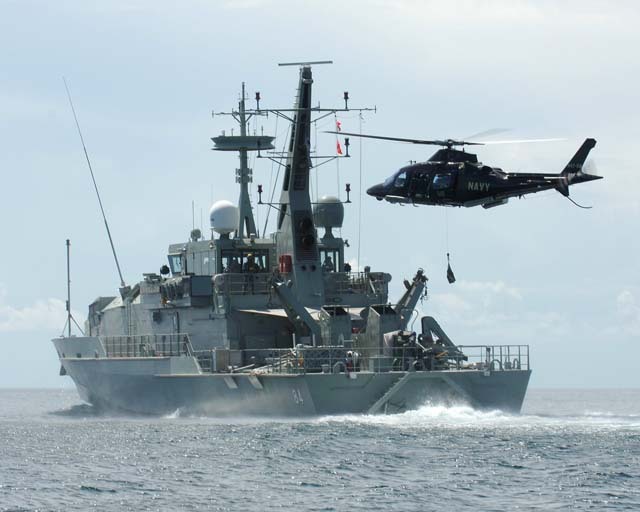 Helicopters continued to embark aboard HMA Ships Moresby, Stalwart, Jervis Bay, Success, Tobruk, Kanimbla and Manoora as well as the RAN's Adelaide Class Guided Missile Frigates. When embarked, they did so as single unit Flights rather than as a Squadron. This change in the way Squadrons normally operated necessitated a change in training and technical support procedures at Albatross enabling these small units to operate largely independently, commanded by a CO normally based at Albatross. In June 1985 the patrol boat HMAS Wollongong (II) struck rocks near Gabo Island seeking shelter from a Bass Strait storm. The Albatross XO was a patrol boat veteran and was informed at midnight that he was leaving on a 300 kilometre Sea King flight in twenty minutes and that perhaps he should take a sweater as the weather was shocking, and he could expect to be away for a week in the open on an isolated beach. The flotation bags and salvage equipment carried by the helicopters contributed to a successful refloating several days later. A Sea King helicopter landed in the car park of a takeaway restaurant in Mallacoota, loaded forty hamburgers and returned to give the salvage personnel their first hot meal for days. Squirrel helicopters and a HS748 in front 'B' Hangar at HMAS Albatross. With the number of personnel stationed at Albatross falling, and the local Shoalhaven economy feeling the losses, the RAN started to encourage other defence activities to use the excellent facilities at NAS Nowra. Army exercises became a more regular occurrence in the area and Albatross also became a popular venue for Defence related seminars. By the end of 1986, the number of Defence visitors to Albatross had reached record levels. Much effort was also put into the Naval Aviation Museum to increase visitor numbers and therefore its economic viability. Coach tours were encouraged and displays rearranged to emphasise the technological advancements in Naval Aviation over the years. Historic flight days were also introduced on a monthly basis. The decreasing numbers did, however, enable a rationalisation of on site accommodation with a number of older buildings being removed, renovations for others, as well as a general beautification program for the Station. The FAA made a significant contribution to the RAN's 75th Anniversary celebrations in 1986. 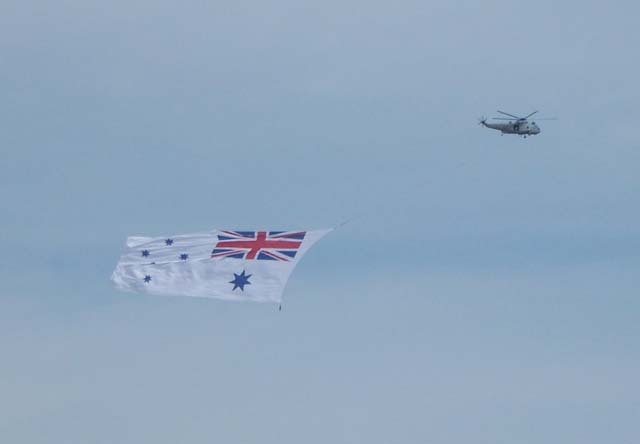 The previous year, a RAN Sea King had successfully flown a Victorian State Flag measuring 48 feet by 24 feet for the 150th Anniversary Bay Day celebrations on 2 November. 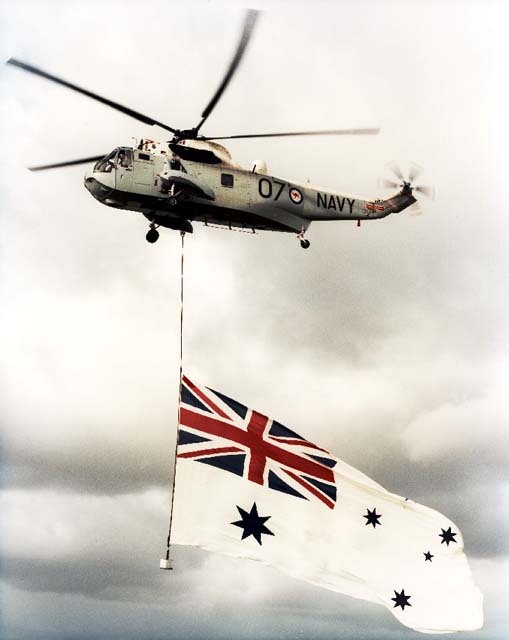 On 24 January 1986, a fly past in Sydney Harbour featured a Sea King flying a large White Ensign. A number of fly pasts followed throughout the year including at the at unveiling of the National Naval Memorial by Queen Elizabeth II, the RAN's 75th Anniversary Fleet Review and the James Hardie 1000 Motor Race at Bathurst (the RAN also flew Prince Philip to Bathurst in a Sea King). Sea Kings also provided transport for Pope John Paul II during his visit to Australia and personnel from Albatross also provided a Royal Guard for his visit. On 6 October 1986, 30,000 people attended the Albatross Air Show which featured aircraft from the Australian, UK and US Armed Forces as well as a number of vintage aircraft. It was also during 1986 that the Australian Joint Anti-Submarine School was renamed the Australian Joint Maritime Warfare Centre before moving to RAAF Base Williamtown in December 1990. A Sea King flies the White Ensign. 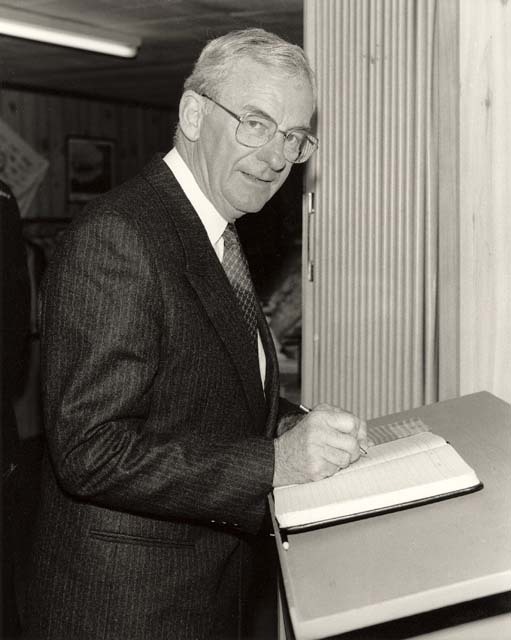 His Excellency the Governor-General Bill Hayden signs the guest book at the Naval Aviation Museum in 1988. An Iroquois takes off from HMAS Albatross for the last time on 31 May 1989, piloted by LEUT Keith Champion and Albatross Commanding Officer, CDRE Matt Taylor, sitting right seat. Ceremonial duties again came to the fore in 1988 as the FAA made significant contributions to Bicentennial celebrations around the country. RAN helicopters participated in an Australia Day fly past over Canberra which included some 160 Defence Force aircraft, in the Bicentennial Naval Salute on Sydney Harbour in October with Sea Kings again flying flags, and the Bicentennial Airshow at RAAF Base Richmond later that same month. Moves were also made early in 1988 to establish a new home for Naval Aviation Museum. A committee was established under the chairmanship of Rear Admiral Andrew Robertson to raise funds for a new hangar for the Museum. A foundation stone for the new building was laid down by Admiral Sir VAT Smith in October and construction began in earnest the following year. The HS748s had performed invaluable disaster relief operations in 1974/75 in the aftermath of Cyclone Tracy and the Tasman Bridge Disaster. In 1989, they were again called upon to provide a community service of a different kind. Following the breakdown in talks between commercial pilots and domestic airlines, the Government decided to break the pilots strike by using Defence aircraft to transport civilian passengers. Over the course of four months, HC723 Squadron's HS748 flight carried over 10,000 passengers between Sydney, Canberra, Melbourne, Hobart and Launceston. Prime Minister Bob Hawke travelled to Albatross to personally congratulate the crews (there were only three), and the Flight was awarded the Navy League of Australia Plaque for Aid to the Civilian Community and would later be adopted by the City of Launceston. 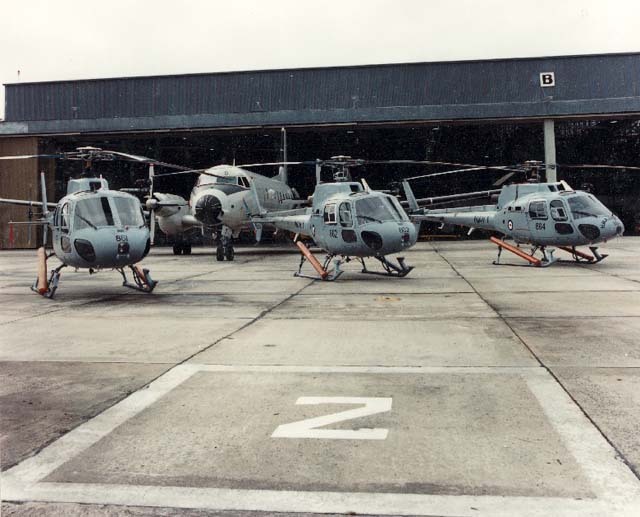 An era also came to an end in December 1989 with the iconic Wessex and Iroquois helicopters both being decommissioned. This was offset, however, by the commissioning of the first Sikorsky S-70B-2 Seahawk anti-submarine helicopter in February 1989. Construction works as the 1980s came to an end included a new stores complex, a Seahawk Simulator building, and improvements to the Motor Transport complex and emergency generator facility. RAN Sea King Shark 04 engaged in dipping sonar operations. On 2 August 1990, Iraqi armed forces invaded the neighbouring kingdom of Kuwait and eight days later, the Australian Government announced that HMA Ships Darwin, Adelaide and Success were to be deployed to the Gulf of Oman in Operation DAMASK, the Australian component of Operation DESERT SHIELD. The FAA embarked helicopters in each of the ships and arrived in the Gulf of Oman early in September. HMA Ships Sydney and Brisbane (DAMASK II) would relieve Darwin and Adelaide in early December while HMAS Westralia relieved Success on Australia Day 1991. On 17 January 1991, Operation DESERT STORM, the final assault to push Iraqi forces out of Kuwait, commenced. FAA aircraft continued to perform a range of tasks including mine search, combat search and rescue, and early warning of any potential threat arising from Iran. By 26 February 1991, the war was over and the Australian ships left the Gulf on 22 March. The Aviation contingent provided by HC723 and HS816 Squadrons had contributed significantly to the RAN's capacity to perform in a combat situation. FAA aircraft continued to operate in the Gulf and North Red Sea for the next decade (Operations DAMASK III-X) enforcing United Nations Security Council sanctions against Iraq and continue embarked operations in the Gulf today as part of Operation CATALYST. Apart from operations in the Middle East, FAA detachments were utilised in a number of operational deployments throughout the 1990s including to Bougainville in 1990 as a contingency response to civil unrest, however, as tensions eased on the island, the deployment was cancelled and HMAS Tobruk returned to Australia. Tobruk returned to Bougainville in October 1994 after another period of civil unrest. Following landings at Arawa, Wakunai, Panguna Mine and Buin, one of the embarked Sea Kings returned to Tobruk with bullet holes in its tail. Sea Kings would be back in Bougainville in 1997/98. Tobruk also deployed to Somalia for Operation SOLACE, offering famine relief in 1992/93 with a Sea King embarked. Five Seahawks were deployed to Indonesia during violent demonstrations and riots during May 1998 in preparation for the possible evacuation of Australian nationals. Two of the aircraft were embarked aboard RAN Frigates while three more were flown to Indonesia by a Russian Antinov 124 transport aircraft. During September 1999, a 723 Squadron Squirrel was embarked at sea, this time in HMAS Anzac as part of the Navy's contingent for Operation WARDEN, the Australian response to the East Timor crisis. The aircraft was involved in surface search operations. Flying operations at Albatross throughout the 1990s again involved a number of civil aid tasks exemplifying the FAAs versatility. In April 1990, the Sea Kings of HS817 Squadron deployed to Dubbo in NSW to assist in flood relief operations around Nyngan. Early in 1992, the FAA was supporting fire crews fighting bushfires around Nowra and barely four months later was again involved in flood relief operations in the same area. The Sea Kings were again involved in fire fighting efforts, carrying large buckets of water to bush fire affected areas during the devastating fires in NSW in 1994. The success of fire fighting efforts in 1994 meant that naval aircraft have continued to be utilised in that role, most notably in 1998 on largely inaccessible bushfires on the NSW-Victorian border and again in 2003 in Southern NSW and the ACT. Four aircraft, three Sea Kings and a Seahawk, also participated in search and rescue efforts in December 1998 as yachts participating in the Sydney to Hobart Yacht Race ran into a deep depression in the southern ocean. Wild seas and 100kph winds destroyed many yachts and created a widespread disaster. 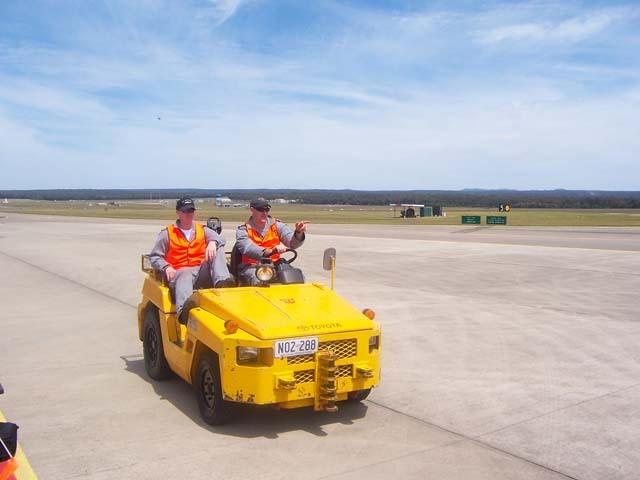 Ground crew on the tarmac at HMAS Albatross. The 1990s were also defined by a number of changes to the administrative and command and control functions of Albatross. The CO of Albatross no longer exercised operational command of the squadrons, the Commercial Support Program was introduced whereby a number of maintenance and repair functions were taken over by private companies and the Australian Defence Force as a whole underwent a major reform program. This upheaval was reflected in a lack of facilities projects for the Station. By the close of the decade, however, a new redevelopment program was in place beginning with the construction of a new Air Traffic Control facility in March 1999 and was closely followed by a new hangar, training centre and fire station. Organisational problems following the abolition of the Director of Naval Aviation Warfare position in 1993 came to a head in 1995 as spares shortages, personnel losses, inadequate recruitment and a lack of policy direction severely threatened the FAAs ability to function. 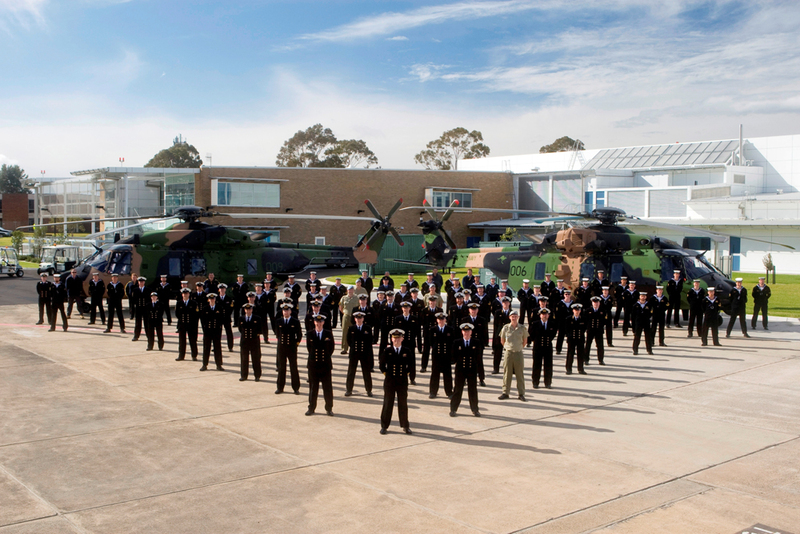 In February 1996, the position of Commander Australian Naval Aviation Force was established at Albatross. The position was to oversee and manage maritime command of the FAA (while not directly impacting on the Squadrons' relationship with Maritime Commander Australia) and centralise the disparate policy elements within Navy Office in Canberra and Fleet Headquarters in Sydney. 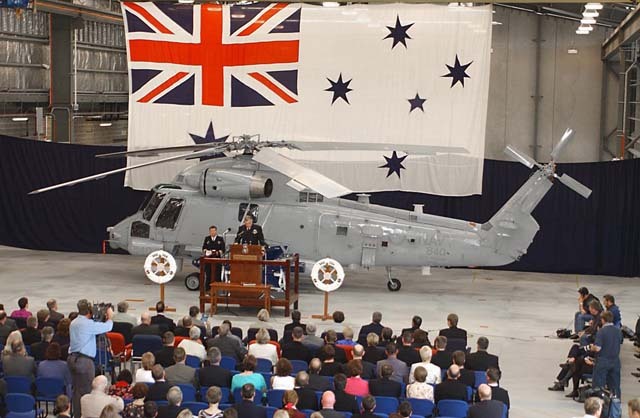 Chief of Navy, Vice Admiral Chris Ritchie, speaks at the RAN Seasprite acceptance ceremony at HMAS Albatross on 18 October 2003. On 28 February 2001, 805 Squadron recommissioned for the fourth time in Australian service at Albatross as an attack helicopter squadron, equipped with 11 specially configured Kaman SH-2G(A) Super Sea Sprites originally procured to operate from the decks of the RAN's Anzac class frigates. However, the Super Sea Sprite program was cancelled on 5 March 2008 and the Squadron was again decommissioned four months later on 26 June 2008. On 2 April 2005 disaster struck 817 Squadron when it lost one of its Sea Kings during Operation SUMATRA ASSIST II, a relief operation providing assistance to the people of Indonesia following the devastating earthquakes of 28 March 2005. The Sea King (call sign Shark 02) launched from HMAS Kanimbla (II) in response to a report that villagers in Amandraya on the island of Nias were in urgent need of medical assistance. The aircraft had on board a full crew and Air Medical Evacuation (AME) team and concerns were raised when communications were lost between it and another Sea King operating in the area, Shark 21. Sadly, Shark 21 subsequently reported that Shark 02 had crashed at the village of Amandraya. Nine of the Sea King's crew were killed in the crash and two personnel were seriously injured. This was a devastating blow to the close knit 817 Squadron and the Naval Aviation community. Two new aircraft types were introduced in 2007, the first being three Agusta Westland A109E Power training and utility helicopters which were leased for four years from Raytheon Australia beginning that January. Later that year the RAN introduced another aircraft type when 817 Squadron started a replacement program with the first of six new NH Industries MRH-90 utility helicopters arriving in the RAN on 13 November and accepted into service the following month. The MRH-90 fully replaced the iconic Sea Kings in 2011 after more than three decades of sterling service. Three Sea Kings performed 817 Squadron’s final ceremonial flyover on 15 December 2011, flying over Sydney and Canberra before returning to Albatross for the last time. The Squadron decommissioned, and the Sea Kings paid off, the following day. One Sea King remains at Albatross, on display at the Fleet Air Arm Museum. The MRH-90s are operated by 808 Squadron which recommissioned in 2013. An MRH90 conducts maritime trials from HMAS Manoora off the Tasmanian coast in October 2009. RAN Agusta Westland A109E above HMAS Larakia. RAN Sea King flies the White Ensign at the HMAS ALBATROSS 60th Anniversary Air Show. Albatross celebrated its diamond jubilee with an Anniversary Air Show on 26 October 2008 with all three squadrons and other participants flying a variety of aircraft including many from throughout the history of the RAN Fleet Air Arm. The Albatross redevelopment program continued into the new millennium and has included a new aircraft wash facility, corrosion control facility, fitness centre and the Helicopter Underwater Escape Trainer. The new decade heralds a new, exciting and challenging era for the RAN’s aviation community as the impending commissioning of the Canberra Class LHDs signals an expanded amphibious role for naval aviation. The commissioning of the new amphibious ships coincides with the establishment of a new Helicopter Aircrew Training System (HATS) which centralises Navy and Army aircrew training at Albatross. HATS will comprise approximately 30 twin engine helicopters with options for basic and advanced avionic systems; a mix of synthetic training devices; new maintenance, training, administration and warehousing facilities; an aviation training vessel; and logistic through life support. When it is completed, it will represent a significant development for rotary wing aircrew training in Australia. NUSQN 808, 18 August 2011. The 2012 ‘Tour the T’ fun run. Shoalhaven residents have the rare opportunity to get out on Albatross’ T-shaped flight deck. The first annual 'Tour the T' fun run was held at Albatross on 30 July 2010 raising money for local charities. 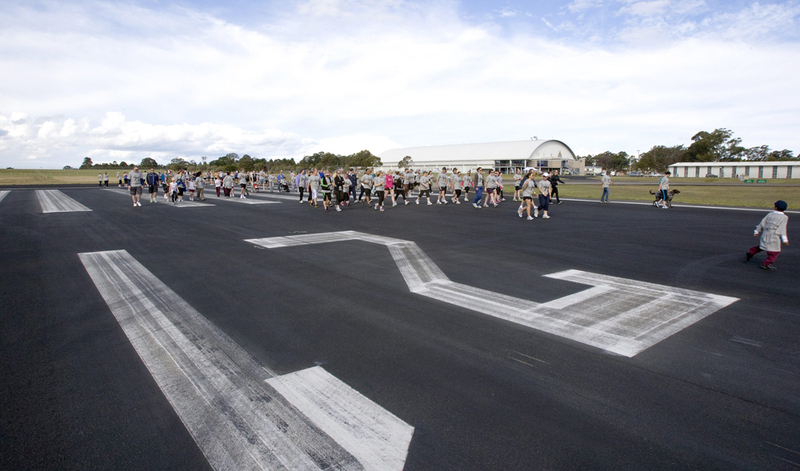 The fun run gives Shoalhaven residents the rare opportunity to get out on Albatross’ T-shaped runway undertaking either a 4km walk or an 8km run along the runway. With the introduction of new aircraft, a major redevelopment and refurbishment program was also undertaken. The program not only included new facilities for the aircraft, but also included 170 new accommodation units. On New Years Day 2011 aircraft and crews were brought to 24 hours notice in response to the developing flood crises in Queensland and northern New South Wales. Aircraft deployed on 3 January in support of Operation QUEENSLAND FLOOD ASSIST providing emergency relief and assistance initially in Queensland and later in New South Wales and Victoria. 817 Squadron decommissioned in December 2011 with three Sea Kings performing a ceremonial flypast over Sydney and Canberra on 15 December before returning to Albatross for the last time. The Squadron decommissioned, and the Sea Kings paid off, the following day. One Sea King remains at Albatross, on display at the Fleet Air Arm Museum. In March 2012 723 Squadron began taking delivery of three Bell 429 training helicopters to replace the three Agusta Westland A109E Power helicopters which were returned to Raytheon. The Bell 429s were also leased from Raytheon to supplement the Squadron’s training capabilities providing further development opportunities for junior pilots, aviation warfare officers and aircrewmen. The squadron’s Squirrel helicopters were once again called upon for aid to the civil community that same month flying reconnaissance missions over the flooded Riverina region. Today, HMAS Albatross remains Australia's only Naval Air Station and is home to the FAAs three Naval Air Squadrons continuing a proud tradition of naval aviation in Australia. The dummy deck at Albatross with the new Canberra class flight deck superimposed. 'Flying Stations: A Story of Australian Naval Aviation' Australian Naval Aviation Museum, Allen & Unwin, St Leonards, 1998. 'HMAS Albatross: A Collection of Memories' Australian Naval Aviation Museum, 2000.